We had successful trip to the Keys in the middle of February. We flew into Key West directly from Charlotte, NC . 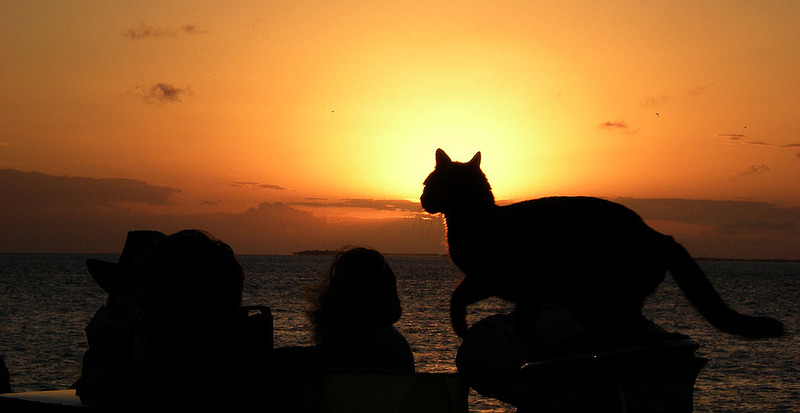 The direct flight is new for Charlotte and one reason we decided to go to the Keys. It made for a quick two-hour flight with very few issues. Many people do not realize this is available. We had not been to Key West since the early 90s so it was quite a bit busier, but the Sunset Party was fun on Mallory Square. We had reserved bikes from a shop, but could not get in touch with them the next morning, so we found another shop called Eaton Bikes. It is located on Eaton Street five blocks off Duval They were very accommodating and even put racks on the bikes so we could carry our panniers. We usually do self-contained trips and carry our essentials. I highly recommend this shop! We took off for Big Pine Key. Made a stop at No Name Pub. Good food off the beaten path. The road that took us there on Big Pine (Gulf Side) was nice and quiet compared to US 1. That night we stayed in a very cool place called The Barnacle Bed and Breakfast and Dive Resort on the Atlantic side of Big Pine, about three miles off US 1. It had a kitchen and grills but we ordered Chinese food to be delivered. When you are on a bike it’s not always convenient to get to a restaurant so it was nice to be able to order out. The place was right on the water, a beautiful peaceful place. Many deer roaming around. 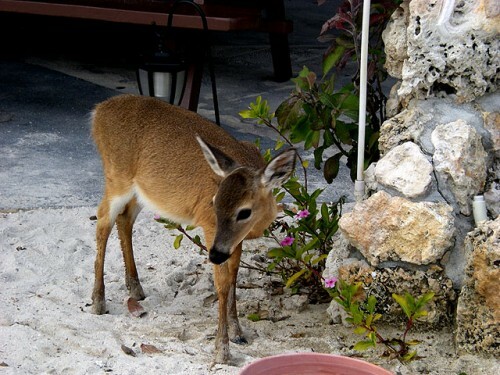 I’ve never seen deer (begging but harmless) on the beach!! We had a great breakfast the next day and took off for Marathon. The weather was cool and cloudy for our trek over the 7-Mile Bridge, so we did not get to experience the beautiful colors of the ocean water. It was a interesting ride. Not as intimidating as I was expecting. Pretty good shoulder. We stayed 2 nights in Key Colony Beach Motel in Marathon. My brother-in –law works at the Dolphin research Center and lives in Marathon. 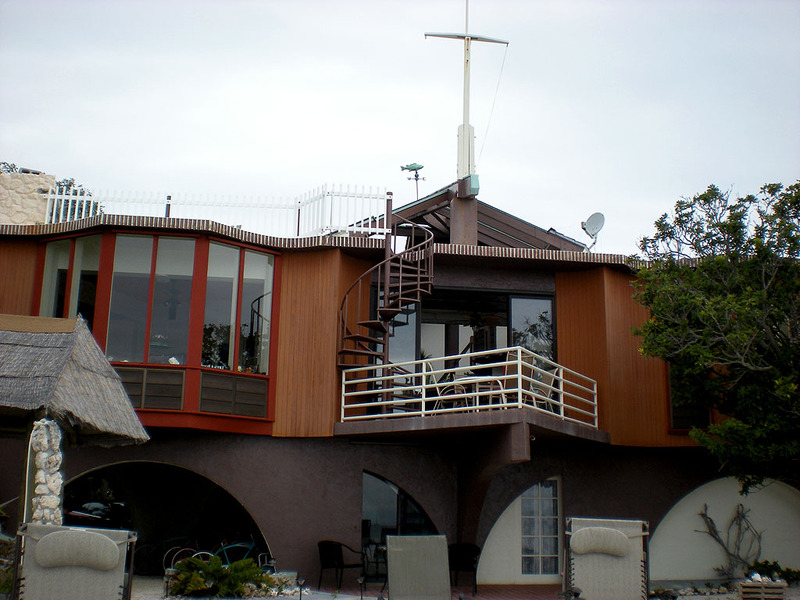 He booked us a room at the Key Colony Motel right on the beach. A little rustic motel, but a quiet community, which was nice since most of Marathon is off the Highway. The Key Colony area had two really good restaurants, Sparky’s and Cabana Breeze, both with live music.The motel was next to Cabana Breeze and a liquor store. All the essentials! 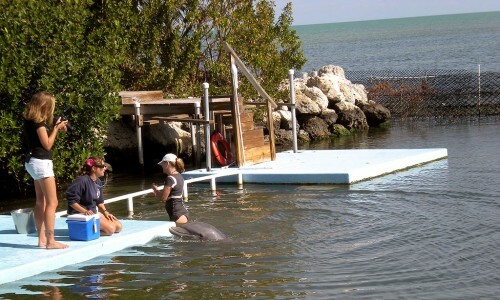 On our way to Islamorada we stopped at the Dolphin Research Center ( 5 miles north of Marathon. I recommend a stop here for any age. 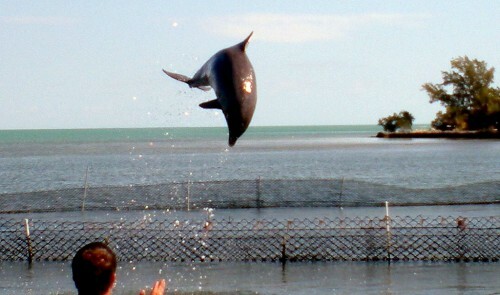 We were able to “meet the dolphins” and see a great dolphin show. In Islamorada we stayed in the Drop Anchor Resort and Marina (MM 85) on the Atlantic side. 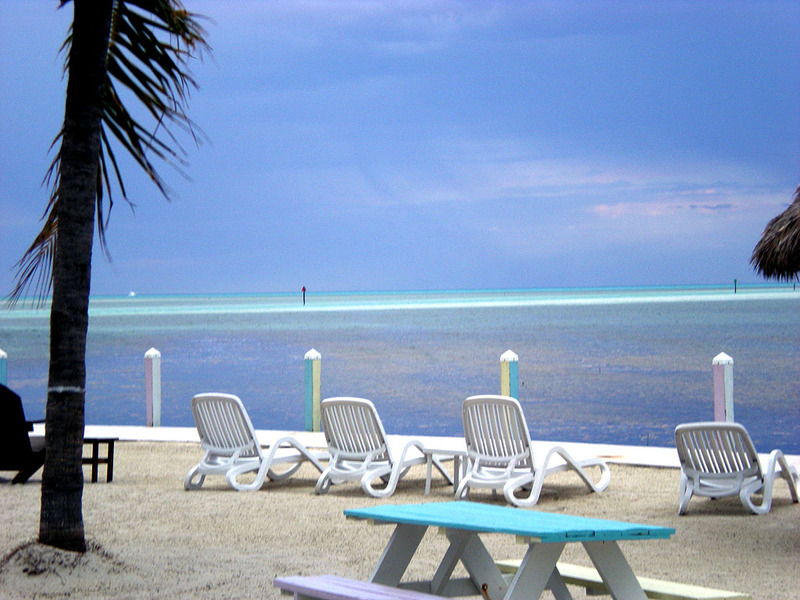 A storm was on the horizon so we did not get to spend too much time on the beach area, but I would have love to spend an extra day lounging here! The next day we headed south to Middle Torch, and it was a 60-miler including the Seven-Mile Bridge. Unfortunately we had rain and high winds. We rode to Marathon and then caught a very accommodating cab service, Dave’s Island Taxi Service. They had bike racks on their vehicles and took us over the bridge and to Middle Torch. It was a smart move. 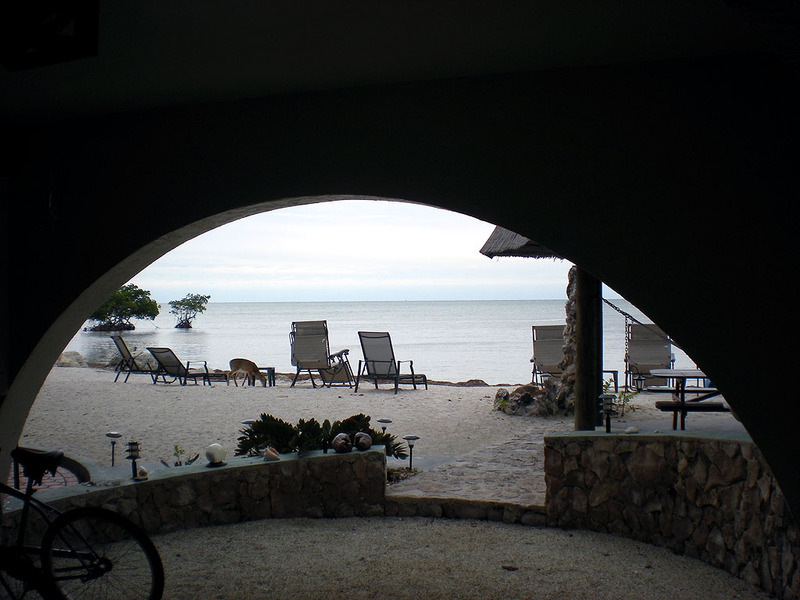 We stayed at the Parmer’s Resort on Middle Torch Key. 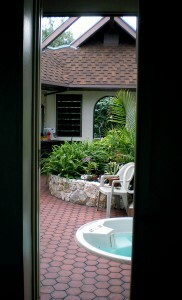 Nice place with a heated pool and a restaurant right down the street that we were able to ride our bikes to. Never got a picture of the resort but a beautiful rainbow appeared right out of our door. The next day we did an excursion on Middle Torch that took us many miles down toward the gulf side of the keys. Recommend this because of the remote quiet roads. 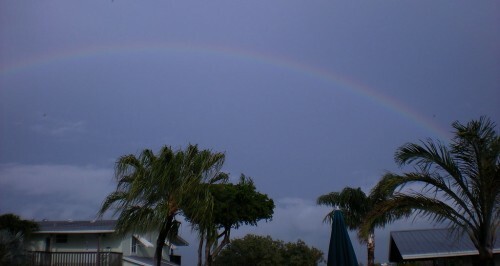 From there we finished back in Key West for another night on the town. We stayed at the Crowne Plaza Key West – La Concha both times. Good location. All in all, the ride was great. We thought there would be more travel on bike paths especially from Key West to Marathon but I know they are working on it. The shoulders were very generous and we never felt in danger. From Marathon there was a great path to Grassy Key. 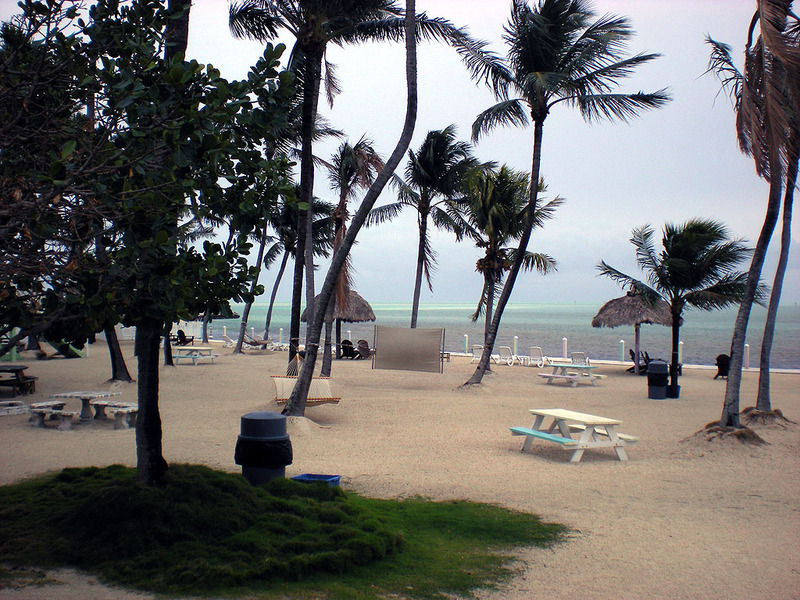 Some construction was going on after that, but once we passed that area there was a pathway almost all the way to Islamorada. That was nice and the views going over the bridges were amazing. Maybe one of these days the old bridges will be renovated and the old 7-mile bridge will be a great adventure. Like any state, funding for bike paths is always at the bottom. But they are progressing and it will be a great ride when every thing is connected. Oh well, great way to see the Keys!! 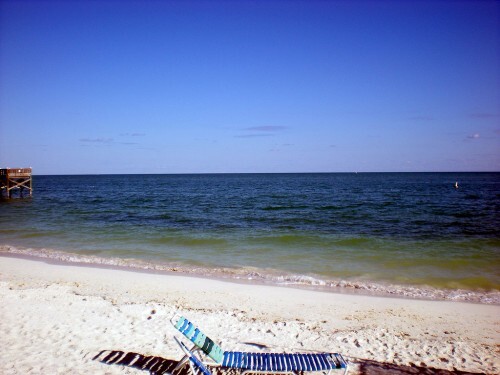 Five of us rode from Key Largo, Mile Marker 100, to Key West, Mile Marker 0, in February 2001. It was a good ride. We had many the same impressions as the Nutty Family. If you have any questions for Tina, leave a comment here and I’ll see that she gets it. I really appreciate her sending us her ride report.